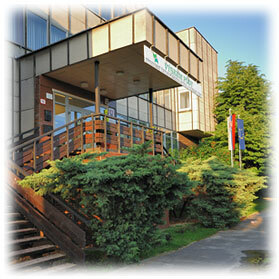 Soil Science and Conservation Research Institute (SSCRI) in Bratislava is the major pedological institution in Slovakia. It has over 60 scientific staff specialized in all key branches of soil science and modern technical equipment. The institute has many significant positions in scientific world supported by accredited soil and water laboratories, remote sensing (orthophotomaps and satellite images) and GIS tools. It is aimed on basic and applied research projects. The SSCRI is active in many areas of pedological, agricultural and environmental research. It is responsible for soil survey and pedological research and it provides the Register of Slovak Soils, comprehensive Soil Information System, and Soil Conservation Service working as separate unit, analytical services done by laboratories with international accreditation, soil map archive and national soil sample archive. Besides of that, SSCRI is the Centre for Remote Sensing of Soil and Land and Programme of Rural Development the National Focal Point of UN Convention to Combat Desertification. It participates within the EU Framework Programme for Research and Technological Development as well as in other international programmes and projects. SSCRI carries important activities in the frame of Common Agricultural Policy EU (CAP), especially inside the Integrated Administration and Control System IACS. Moreover, SSCRI provides expert services for governmental authorities, partner scientific and education institutions and other bodies conducting activities in agriculture, environment, urban planning and regional development. Research, modelling and management of soil water regime. Soil Strategy Network in the Danube Region (SONDAR) – Slovak-Austrian cross-border cooperation Programme 2007-2013. SSCRI is to provide expert services for governmental authorities, partner scientific and education institutions and other institutions and enterprises active in agriculture, environment, urban planning and regional development. SSCRI is the Centre for Remote Sensing of Soil and Land and Programme of Rural Development the National Focal Point of UN Convention to Combat Desertification. It participates within the EU Framework Programme for Research and Technological Development as well as in other international programmes and projects.